Is SEO Right For My Business? A Critical Examination. SEO or Search Engine Optimization is the process by which companies increase their visibility on search engines like Google and Bing. The goal of SEO is to get your website to the top of these search engine result pages (SERPS), thus making your brand easy to find and accessible for users when they enter related queries. This process is ongoing and utilizes elements like title tags, and strategies like link-building to get your page to the top of search engines. It seems like a simple equation, high rankings on and more visitors who convert into leads resulting in more sales, but this isn’t always the case and it’s often very expensive making your ROI almost non-existent. There are some industries and types of businesses that SEO can have little to no effect on. If you’re sinking too much time and money into SEO and seeing little to no results, this could be the case for your business. Luckily, here at AdLuge we’ve identified some of these businesses, as are mandate is to save you money and market intelligently. The following are some industries and types of businesses that SEO doesn’t necessarily work for. 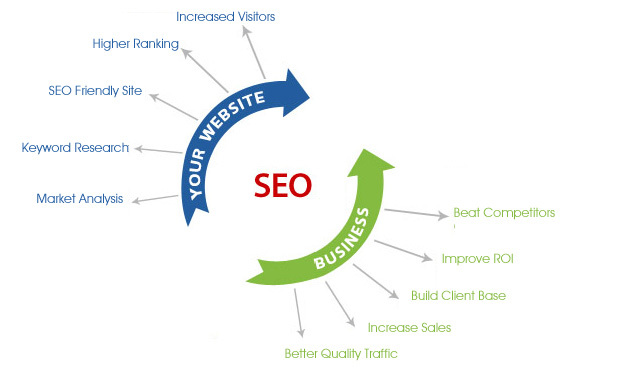 When you are entering a crowded saturated market as a SMB, SEO may not be advantageous to you. Simply put, in some industries there are just too many options out there and attempting to substantiate your SEO may be a mistake. An example of one such industry would someone who want to sell a book. You may want to increase your SEO rankings, but trying to go up against large established companies like Amazon, Chapters, Indigo, Barnes and Noble is a losing battle. This doesn’t mean abandon your web site or online goals, but organic ranking to compete with industry leaders is just not for you. The same could be the case in smaller eCommerce businesses. Let’s say you own a bookstore, getting conversions online by beating out industry leaders, may be too lofty an ambition when competing with a company like Amazon Refocusing your strategy locally and through social media may be a better option. Google+ Local might be your best option for ranking organically. Businesses such as real estate that are largely based off referrals can often suffer from focusing too much attention towards their SEO. Well it can be helpful in generating new leads, prospective buyers are more likely to opt for a real estate agent through word of mouth and hearing testimonials from a trusted source instead of a stranger. Focusing your attention on social media and becoming an accessible resource can be a stronger option for these types of businesses. Social media can allow you to develop more insight to your customers and enables you to construct a conversation and learn about your leads. Basic everyday items like toilet paper, dish soap, toothbrushes, etc. Will have a distinctly tough time ranking through SEO.The problem here is if most people are just going to go to their local supermarket or big box store to get it, you’re probably going to have a hard time using SEO to sell it online. Niche products are also bound to suffer through SEO. This is because there products are so specific that there is just no search volume for them through SEO and focusing too much time and money to organic search may be a mistake. An example of one such niche product could be an company that sells organic feed for a certain breed of horse. Your target is just too specific that there may not be enough search volume to sustain a business. If your business is struggling to see ROI through your SEO campaigns, it may be time to reorganize your strategy. Make sure you are a business that can benefit from SEO and don’t get obsessed in seeing your rankings at the top. Market smart and use other avenues such as social media, Google Ads and traditional advertising methods to reach your target audiences. If you’re going after keywords where the competition is too high you’re going to have a tough time ranking. The number one question you should ask yourself before starting an SEO campaign is: does your product or service provide a high enough margin in that each sale will pay for the marketing costs and actually earn you a profit? If you’re trying to sell a $15 CD through SEO then I wish you good luck, but I would advise you to look at other marketing options. I’m so glad you’ve addressed this issue. There seems to be a universal misunderstanding amongst small business owners about what SEO actually is, and who it actually works best for. It seems like with everybody on tight budgets, everyone wants SEO to be the end all and be on of their online marketing strategy since it is considered the cheapest way to go. A good way to understand SEO is to hire an intern! High school students are already active online and have a good grasp of various social media sites! I believe each company should have some form of online presence. Even if the account remains untouched, as long as it can be Googled, a possible client can always from it. No one can stress how much SEO is important for business. If done correctly, that is using white hat techniques, it can be very profitable in the long run. It takes time to gain momentum, but once it is there, there is no stopping it. Beautiful article, and thank you for sharing.